The Moravian Brothers (Moravští bratři) began life following the demise of the Czech theologian Jan Hus in the 15th century. Escaping Catholic resurgence in lands of the Bohemian Crown, on the back foot of Moravian Church dialectic they found refuge in present day Saxony. This was after the war at White Mountain whereby the Hussite unity subsequently went into hiding after their defeat. Following further subjugation, this protestant church sought reclamation of Moravian heritage in the New World and dispersed missionaries to the east coast of the United States; established communities are now located in Pennsylvania, North Carolina and Virginia. In the 21st century, we have the New York based organisation ‘Twisted Preservation’. Their work as a cultural institution and museum has proven crucial for the conservation of heritage sites through their dynamic, community centred approach. They have extensive experience in preservation of cultural sites which has driven them to work beyond their city base and throughout the country, from California to North Carolina. Most importantly, they have stepped foot into the Moravian communities of Old Salem and Bethlehem in Virginia. Franklin Vagnone, anthropologist and archeologist is the founder of the organization and is also the author of the One Night Stand blog, through which he is trying to popularize a modern approach to conservation discourse under the administration of the National Trusts. He is co-author of the Anarchist Guide to Museums of Historic Houses. The book focuses on concepts that help cultural institutions raise audience interest and work with visitors’ experiences. Twisted Preservation practice innovative methods whereby restoration alone is enhanced by dynamic transformations of how the site itself is used. Most importantly the organisation advocates ‘cultural consultations’ such as public presentations, strategic planning and board retreat facilitation yet the organisations true merit is the creation of contemporary cultural spaces within sites of invaluable historical importance. Breathing new life into these sites provide an animus for the persistence of conservation. The Bryn Athyn Cathedral project (1998-2006) involved the restoration of the historical complex which has since been completed whereby the site is used for community workshops. The Old Salem ‘living museum’ represents the encumbrance of a journey that spanned from the old to the new world; an embellishment of the odium that divided Christianity in the Bohemian crown. We at The Czech National Trust wish to cooperate with Twisted Preservation for reasons that have spanned time, conflict and borders; the fruit of heritage preservation can be wholly seen within our shared cultural memory of these sites of old. The establishment of a project between the two organisations puts this under the gaze of the international Moravian community through which conservation of historical sites will provide remittance and effective management. It is in best interests that this collaboration allows for the recognition of the Moravian Brothers legacy, that not only exists in the history books-the project will be intrinsic to Czech heritage itself. 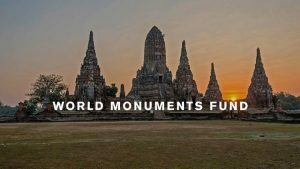 The World Monuments Fund (WMF) is a not-for-profit organisation founded in 1965 that is dedicated to the preservation of sites that hold unequivocal cultural importance; “The stories sites tell are universal. The dangers they face are immense”. For more than half a century the WMF have paved the way in conserving sites of special cultural interest which are irreplaceable to the communities that value them. The organisation identifies architecturally important sites from all periods of human civilization, as well as unique cultural customs and traditional crafts. We live in a world where cultural treasures are facing immense pressure due to the fiat of ongoing natural and human ensued processes such as earthquakes, landslides, floods as well as issues such as conflict and lack of care. The WMF will act accordingly to such pressures and protect sites from further degradation with a plan of recovery. The protection of cultural heritage has been the primary motivation for the WMF and together with its local partners they can provide financial and technical support for areas that need it most (to ensure sustainability). Since the beginning of its existence, WMF has managed to support more than 600 projects in 90 countries. Today, together with affiliated organizations based in England, India, Peru, Portugal and Spain, the WMF sponsors projects for the preservation of cultural heritage around the world. Furthermore, the WMF works right in the heart of the communities who are the true guardians of such cultural treasures. They are provided with the infrastructural means to counteract degradation through local and participatory projects; sustaining such sites will bring enjoyment and appreciation for future generations. WMF teams are composed of international specialists who lead pilot projects, organize training programs, and plan a long-term management strategy for the projects. The Worlds Monument Watch is the pilot project founded by the Worlds Monument Fund, which aims to identify sites of interest. Every two years, a list of monuments is published of that are under threat because of their isolation and widespread social disregard for cultural value. Organisations around the world have the opportunity to nominate projects that deserve attention. Czech National Trust signed projects last year: Beniess Villa in Litol and Cibulka Mansion in Košíře. We did not get our picks this year, but the CNT plans to draw attention to the WMF sites in the Czech Republic in the coming years as well.